Product information "Thermoelectric Based Cabinet Coolers"
Air-to-air thermoelectric assemblies allow pumping out extra heat from inside small, hermetically closed equipment like telecom and remote control cabinets. They also allow cooling down a limited area to a temperature below ambient (air conditioning). Thermoelectric assemblies (TEAs) are cooling and heating devices, consisting of several high-density heat-exchangers bolted together with highly efficient thermoelectric coolers (TEC) between them. 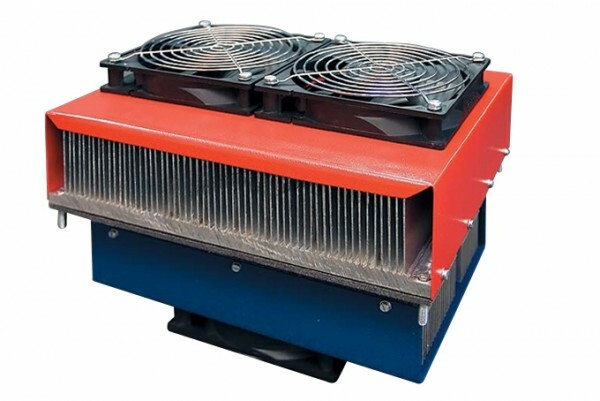 For more efficiency, these heat-exchangers are equipped with fans. Their application allows the creation of temperature control systems with operating temperatures equal or less than ambient temperatures with maximum coefficient of performance (COP). Usage of assemblies does not require special knowledge in the field of thermoelectric cooling design and is able to provide precise temperature control of the object. Assemblies are optimized for 12 V, 24 V and 48 V of onboard supply voltage. TEAs are environmentally friendly – no refrigerant fluid is used. All TEAs are ready for installation by screws. Optionally assemblies could be supplied with a temperature sensor installed for precise temperature control as well as with a temperature controller and a power supply unit. Related links to "Thermoelectric Based Cabinet Coolers"
Customer evaluation for "Thermoelectric Based Cabinet Coolers"